One of the ships featured previously as a caller at Sandbank, FINGAL, went aground on Sanda Island just off the southern end of Kintyre last night, while on passage from Campbeltown to Londonderry. The MCA website has details. The Campbeltown lifeboat ERNEST AND MARY SHAW was called out, and Greenock-based tug SVITZER MALLAIG stood by while FINGAL was refloated at high water, which then towed her to Troon for inspection. 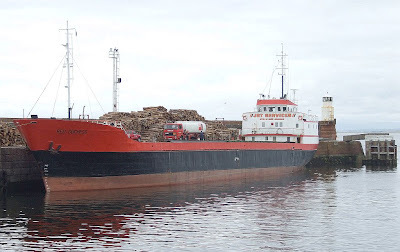 Meanwhile, following a visit to Sandbank on Wednesday this week by FINGAL, Taylor and Taylor's RED DUCHESS is once again back at Sandbank this morning for a cargo of round timber. She is seen here yesterday afternoon taking bunkers at her home port of Troon.